Is Amazon Losing Cyber Monday? Here we go. Cyber Monday. Let's do this. Let's sit back as retailers compete to beat Amazon at a day it invented. Is it possible? Of course. SIGNUM for Retail, powered by more than 750 million shopping-related consumer conversations correlated to more than 12 million retail sales transactions, reveals two Cyber Monday strategies to watch today – and the common thread is building on existing brand equity. Most people would agree that REI has a strong brand with a certain outdoosry set. It connotes harmony with nature, collaboration, and adventure. The store is extremely well-liked by its customers; this is supported by the top explanatory terms bubbled up by SIGNUM Voice. Enter REI's #OptOutside campaign, which breeds goodwill with its staff by closing each of its 145 stores on Black Friday, thereby giving 12,000 employees a paid holiday. But of course this is still capitalism, so the chain works vigorously to make back that lost revenue online by offering savvy discounts on outlet items for CyberMonday. And between the goodwill and the good deals, REI outpaced even Amazon in the intensity of CyberMonday conversations online last year. To accomplish this, REI played to its strengths: taking a communal theme of work-life balance, and subtly making up for the financial difference with innovative digital programs. 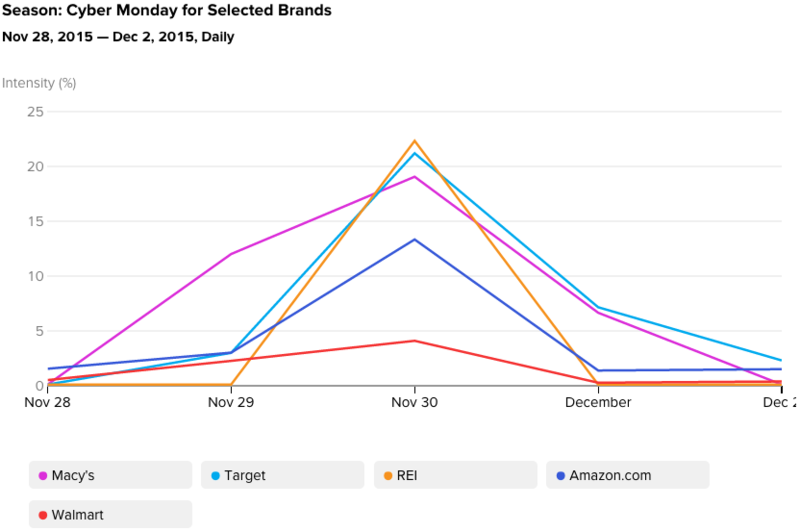 The chart also makes clear that while REI won CyberMonday, the success was short-lived. There was almost no build-up in terms of conversations before November 30th, and by the very next day – relative silence. Our data shows that going forward there's an opportunity for REI to brand the entire holiday season with #OptOutside. One could envision several events throughout the month of December dedicated to service away from the cash register. Why not an #OptOutside food drive at nearby parks, in which every participant gets a $5 online gift card to REI.com? That yellow line needn't dip so fast after 24 hours. The winner of the week in terms of consumer conversations clustering its brand with Cyber Monday was Macy's. The reasons aren't rocket science: Macy's extends the idea of Cyber Monday to create Cyber Week, which, accordingly to a press release put out by the company, offers "five (sic) full days of online specials." Clearly there's a business calculus for every brand as it approaches the holiday season. But a deeper dive into SIGNUM shows the Cyber Week approach pays dividends for Macy's. The line represents the percentage of online conversations about Macy's mentioning sales and promotions. Those conversations spike during Cyber Week and return to concerning levels of normalcy for the rest of the holiday shopping season. Like REI's #OptOutside, Macy's Cyber Week plays to the brand's strength. Whether it's the Macy's Day Parade or the image of the iconic store in Manhattan adorned with wintry tinsel, the retailer is often linked to the holiday season. In the chart below, you can see this is even true during the off months of holiday shopping. Again, the playbook is clear: Macy's has a built-in advantage during the holiday season – the fruits of decades of brand-building in that department. So then it makes perfect sense to double-down (or, in this case, quintuple-down) on that advantage with a Cyber Week. Macy's could get creative with this advantage. Why not a 1-day Christmas sale in July? Curious which retailers are opening your gifts and how you should fight back? Want to know who’s driving your revenue, and how to drive more? Quantifind can illuminate your competitive blindspots and show you how to steal market share.